A few days ago, James Cameron announced, for what feels like the umpteenth time, that Avatar will be getting multiple sequels in the years to come. (Originally, it was two, to be released in 2014 and 2015. Now, it’s three, to be released in 2016, 2017, and 2018. Next year, there will be seven planned Avatar sequels, all opening on the same day in 2025. Get excited!) On those rare days when Avatar again dominates the daily entertainment news, it’s sometimes surprising to remember that this movie, the highest-grossing ever, domestically and worldwide, opened less than 4 years ago. Strangely, for a movie that made so much money and, at one point, had a fanbase so overwrought with emotion that Pandora wasn’t real that they exhibited signs of legitimate depression, Avatar hasn’t left an impactful legacy to many people. Not many films do leave a legacy, certainly not compared to the sheer number of films that open each year, but if you make a movie that grosses more than $2 billion, it’s not wrong to presume that it must have left some kind of mark on the world populace. Most of Pixar’s films have left behind an impressive and easy-to-explain legacy. Toy Story is the Citizen Kane of computer animation, as influential to the family-movie marketplace as Avatar was to the world of 3D. Cars, for better or worse, has become immortalized thanks to a massive construction project that culminated in a land dedicated to Radiator Springs and its vehicular denizens located at the Disneyland Resort. Films like The Incredibles, Ratatouille, and WALL-E may not have as much of a physical place in Disney’s theme parks, but they are often used as the barometer of high quality in Pixar’s filmography, and in animation as a whole. So where does A Bug’s Life fit in? Here’s a movie that inspired, like Cars, its own land at Disney California Adventure, with a computer-animated short film at that land’s core about bugs and their benefit to the world at large. That attraction, titled It’s Tough to be a Bug!, is also housed in Disney’s Animal Kingdom in Orlando in that park’s visual centerpiece, the Tree of Life. (And, to be clear, It’s Tough to be a Bug! first appeared in Animal Kingdom.) A Bug’s Life was highly anticipated prior to its opening, as it was the first new film from Pixar since Toy Story. But now, when people cluck their tongues over potential or official sequels from the Emeryville, California studio, they don’t even consider that we may one day revisit characters like Flik, Atta, and P.T. Flea. It’s easy, and perhaps fitting, to underestimate the charms of A Bug’s Life, a fast-paced action comedy heavily inspired by disparate filmmakers and actors like Akira Kurosawa and Steve Martin. 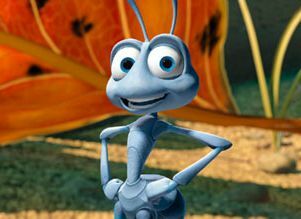 Unlike some of Pixar’s later efforts, A Bug’s Life does not have an unexpected jolt of emotion in the third act or a message that may come as a surprise to its audience. A Bug’s Life is, compared to what would come later at Pixar, simple in terms of its story and characters. Thus, its so-called “Pixar Moment” comes not in a character interaction or in a heartbreaking scene of shocking honesty, but in its technological advances and end credits. Earlier in their history, Pixar was known as much for being technical pioneers as for being clever. Think of the Monsters, Inc. trailer placed in front of the first Harry Potter movie in November 2001, two weeks after the former film was released domestically. In the trailer, Mike and Sulley play a game of charades, and before they reveal that the boy wizard is the game’s answer, the Monsters, Inc. title appeared, along with a suggestion to audience members to saunter over to Monstropolis after their visit to Hogwarts ends. The best example of Pixar’s winking cleverness, though, began with A Bug’s Life: if people stayed through the end credits, they’d be greeted with outtakes. Outtakes of a computer-animated movie. The gag recurred in Toy Story 2, and both instances prove that Pixar’s filmmakers were extremely pop-culture-literate, savvy enough to pick up on recurring jokes and clichés in live-action outtakes. Repeatedly forgotten reaction lines? Check. “Actors” accidentally coming in contact with movie equipment? Check. “Actors” attempting to improv instead of sticking to the scripted dialogue? It’s all there, and even 15 years after the film’s release, this moment is a high point for A Bug’s Life. The movie’s funny enough to begin with, but the last few minutes showed that Pixar’s filmmakers weren’t just paying attention to the technological stodginess of hand-drawn animation and its inherent limitations, but to the trappings of live-action comedy filmmaking. This isn’t to say that A Bug’s Life isn’t memorable in any way before the final five minutes. Hopper, the menacing grasshopper voiced by Kevin Spacey, is one of Pixar’s best villains, alongside Syndrome from The Incredibles and Lots-o-Huggin’ Bear from Toy Story 3. (Of course, it does help that Spacey, who was cast after John Lasseter’s first choice, Robert de Niro, turned down the offer a few times, dives into the role with vicious gusto.) What’s truly striking about the whole of A Bug’s Life is the massive visual step forward it represents, not only for Pixar, but for computer animation as a whole. Toy Story was proof that computer animation could serve as the foundation for a feature film. A Bug’s Life paid off on the promise of what the future could hold, even more than people likely imagined. Toy Story and A Bug’s Life both take place in a stylized version of the real world (and if you wanted to track the Pizza Planet Easter egg/cameo appearance, you could always argue that they take place in the same universe, but that’s a discussion for another day). Toy Story, for all of its charms and entertainment, isn’t now as eye-popping as A Bug’s Life is, precisely because the latter film has a much smaller scale than any human eye could ever perceive. How does a blade of grass or a twig or a leaf look to an ant, instead of to a human? 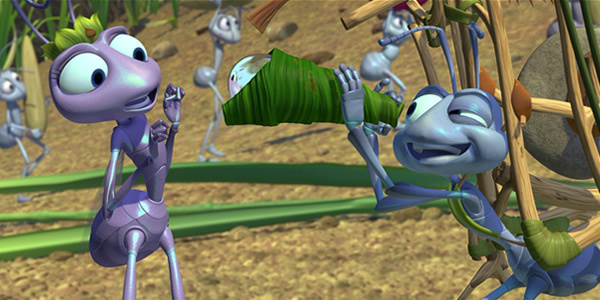 This question is mined for humor from the beginning, but visually, A Bug’s Life offers up a whole new perspective on the natural world. As much as the idea of bugs acting like humans is used to comic effect, the visualization of the bug world is awesome to behold. Whether it’s seeing what damage some grass can do to a walking path or watching an onslaught of raindrops on a quaint little backdrop, this movie’s artistic vision is as superlative as that of WALL-E a decade later. The technology had progressed in that time to a point where we could easily think that WALL-E was trundling around the actual planet; A Bug’s Life isn’t too far from achieving the same goal. The only real detractor—and this is a minor complaint—is the character design, which still has the marks of Pixar’s pre-feature technology. The ants themselves, to emphasize their sameness, have an automaton-like look, which isn’t as appealing as the various and sundry toys in Andy’s bedroom or the fish in the oceans near Australia, and so on. However, A Bug’s Life builds such a detailed and lovely environment that this problem barely registers. The film’s legacy may be that of mild, half-forgotten memories—“Did I see A Bug’s Life in theaters? I think so…”—so it’s worthy of a revisit. The land it inspired in Disney California Adventure may not be terribly memorable (and is far more geared at young children than the movie is), but A Bug’s Life is pleasantly so. The legacy A Bug’s Life left behind can’t be discussed without discussing its direct competition in the fall of 1998, DreamWorks Animation’s Antz. Both movies took place in the world of ants, and both movies featured, as the lead, a nerdy ant who wanted to be different from the rest of his fellow workers. Every so often, Antz will get repeated on HBO’s family channel, and though it may be somewhat enjoyable (in a novelty kind of way) to watch characters voiced by Woody Allen, Sylvester Stallone, and Sharon Stone interact with each other, the film just doesn’t hold up. The animation is flat and weakly detailed, and the characters are defined by their celebrity voices than by actual traits. Since the fall of 1998, DreamWorks Animation and Pixar haven’t ever gotten this close to each other creatively (newt, Pixar’s planned look at the last two newts on Earth, got shelved when John Lasseter decided it was too similar to Blue Sky Studio’s Rio). However, the spoils of that competition remain; most people would agree that A Bug’s Life far surpasses Antz, even if they don’t hold the film up as highly as Pixar’s later efforts. What’s important to note is that A Bug’s Life works where Antz doesn’t because it understands that old adage from This Is Spinal Tap about the fine line between being stupid and being clever. Here, especially, Pixar fell on the right side of that fine line.